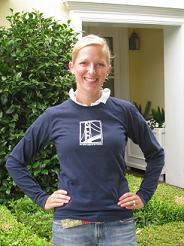 This blue, long-sleeve classic fit t-shirt with the JLSF bridge logo on the front is a great addition to your wardrobe. This t-shirt would be perfect to wear when volunteering and supporting JLSF events. *Please indicate desired size in the comments section of your order. The latest addition to our new merchandise is a baby t-shirt. This t-shirt will be a great gift for the littlest Junior League family members or friends. It comes in a soft pink and a soft baby blue with the white JLSF bridge logo. There is a limited quantity so order yours today! Sizes* – 3-6 months, 6-12 months and 12-18 months. Price includes sales tax and shipping/handling. * Please mention the shirt size and color you would like in the notes section of your order. 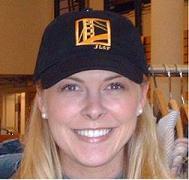 JLSF’s edition of the baseball hat. The hat is made of 100% soft cotton in black. 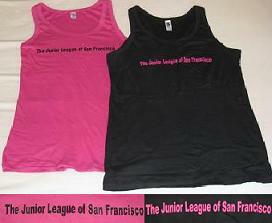 The front has the JLSF logo in gold and the back reads “The Junior League of San Francisco, Est. 1911.” What a great way to display your pride in being a member of the Junior League. Inventory is limited, so don’t miss out on this very popular item! Our white stretch cotton long sleeve t-shirt is fitted with a modern cut. It is guaranteed to become a staple in your wardrobe! It is made with high quality thick cotton that washes very nicely. 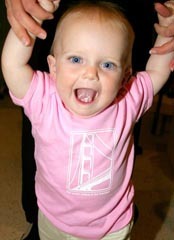 The Junior League of San Francisco is written in either royal or navy blue across the front of the t-shirt. This t-shirt has been wildly successful and is in its second printing. Order yours today and make your wardrobe complete! * Please indicate desired size and color in the comments section of your order. This contoured cotton tank keeps you cool, flatters your form with extra length, won’t constrict movements and stands up to any workout regimen. 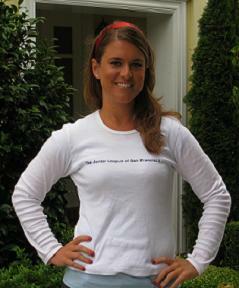 Junior League of San Francisco is printed across the front in a contrasting color to show off your JL Spirit! Get yours today! Colors*: Black w/ Hot Pink writing and Hot Pink w/ Black writing. Show off your pretty new pedicure with these brand new JLSF Flip Flops. 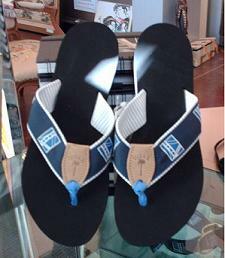 The look – a black flip flop with a 1 inch thick navy grosgrain ribbon with white JLSF bridge logo strap. Who knew that helping out your community could make you feel so stylish. * Please mention the shoe size you would like in the notes section of your order.